Welcome to the new TarponSnookRedfish.com! I’ve been a Charter Captain for more than 16 years, and I’ll be the first to tell you I’m not always an early adopter of new technology. However, over the last few years, we all have a developed more of desire for instant information and the ability to communicate on the fly. In the past my website was static, and I didn’t really have the knowledge to keep it up to date. I’m working hard to change that. Over the past few months we’ve worked hard designing a site that is hopefully more appealing, more informative & easier to maintain. That said, TarponSnookRedfish.com will be an evolution – with much more content on the way. So stay tuned, and please feel free to make recommendations if you’d like to see something new. 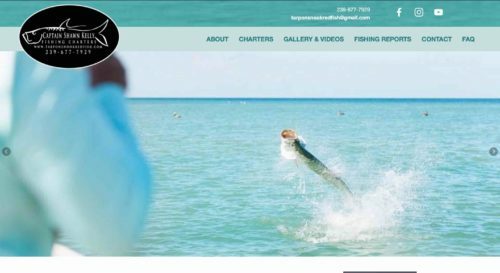 Our website has been completely redesigned with Customers in mind to help you quickly and easily ascertain the status of the fishing on Sanibel & Captiva or, simply make it easy to find and contact us. The new site includes simplified navigation, social media integration, and higher quality photos and a new video section. In addition our new website is mobile friendly to help you effectively and efficiently reach out wherever you are. Please take the time to look around, and if you’ve fished with us before, please take a moment to write a positive review on TripAdvisor.com or Google. (Links are on the right side of the home page.) It would be a great help in getting this site off the ground and running. I’d greatly appreciate it. Videos – On the same Gallery & Video page you’ll see I now have a section that is tied into our YouTube account. I enjoy making videos. I’m not great at it yet, but I’m learning. I’ve also acquired some new tools to make videos more frequent and easier to put together. I now have a drone, a underwater video camera as well as a couple of go pros to capture more frequent (and hopefully better) footage. We are going to have some fun with this! You can subscribe to our youtube page here. Reviews – I always gauged myself by the great amount of return customers I’ve had. However, developing this website made me aware that past customers had posted many positive reviews on Both TripAdvisor.com and on Google. This was great to see! If you’ve fished with me before, please consider following the links on the right side of the home page to submit your reviews and photos! Newsletter – Want to know when we update the site? Maybe you want to see how we did in a fishing tournament, or made out in a storm, you can now subscribe for updates. This won’t be used to spam your email accounts. I hate that. This is just a simple means to be able to reach out when something entertaining or informative happens. You can sign up right on the home page. We hope you come to share our excitement and enjoy our new website, TarponSnookRedfish.com!